REDUCED! 3+1 bed villa plus approval for 1 bed apartment - Property for sale. 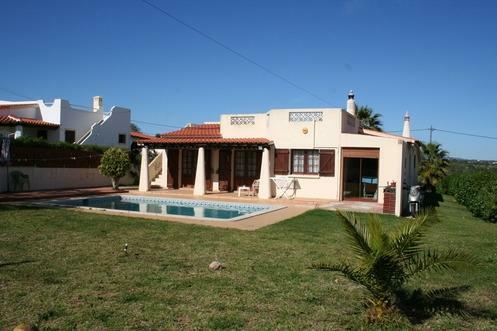 Full Description: In a very desirable location on the outskirts of the Old Town of Albufeira is this renovated 3+1 bedroom bungalow style villa. Within easy walking distance of all amenities it has everything you need to provide a comfortable family home or holidays in peaceful surroundings. Lovingly restored over the past 8 years the house has all the home comforts of a newer property yet still retains a lot of original features enhancing its charm and character. Accommodation comprises an entrance hallway leading through to a large lounge/dining room with fireplace and doors to the South facing patio area, gardens and pool. Another hallway leads to 3 double bedrooms with fitted wardrobes, the master with en-suite shower/wet room and doors to the South facing terrace plus there is a family bathroom. The kitchen renovation has not been completed but plans are in place to extend into what is currently a small sitting room out to a new BBQ area beyond. As it is the kitchen is a decent size, fully fitted and equipped with a utility/storage room. Back in the main hall there is a guest w/c which has plumbing for another shower if required. Also off the hallway is the additional room, currently used as a spare bedroom and for extra storage but could equally be utilised as an office, work room, sitting room etc. Outside the gardens are mainly laid to lawn with some trees and shrubs, a large gated area at the front of the house with driveway for several cars and at the rear again mostly lawn with sunbathing terraces around the swimming pool, all South facing. In the corner of the back garden is a storage room which can be utilised in many ways. A huge plus with this property is the approval of plans for an extension of a self contained 1 bedroom apartment up on the roof terrace, this would greatly enhance, not only the living space, but the value of this already very desirable property. New to the market so early viewing is recommended!